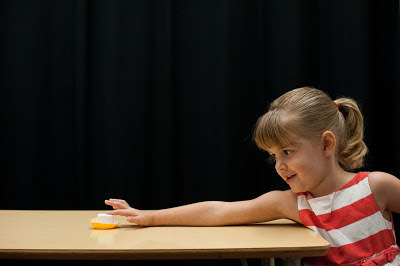 Study reenactment: Evelyn Rose, 4 of Brighton, NY participates in a reenactment of the marshmallow experiment used in a University of Rochester study published in the journal Cognition. The study was conducted at the University of Rochester Baby Lab. The marshmallow test is regarded as one of the most successful behavioral experiments. In the test, a marshmallow was offered to a child; for brevity, consider a male child. If the child could control himself from eating the marshmallow, he was told that he would be given two instead of one. The test lies on how long the child can resist from eating the marshmallow. The marshmallow test began in Stanford University at the Bing Nursery School and was conducted in 1972 led by psychologist Walter Mischel. There were earlier tests similar to this conducted in the late 1960s but it was the test done with the students at Bing Nursery School in 1972 that proved to be the landmark experiment. Mischel wanted to understand how and when the the control of deferred gratification, the ability to wait to obtain something that one wants, start to develop in children. In the original test, the kids were told that if they waited for fifteen more minutes, they will be getting an extra marshmallow. Mischel observed that while some would immediately eat the marshmallow after the researchers leave the room, others would "cover their eyes with their hands or turn around so that they can't see the tray, others start kicking the desk, or tug on their pigtails, or stroke the marshmallow as if it were a tiny stuffed animal". In a later study, Mischel revisited the original test subjects, now in their 40s and noted that those who ate the marshmallow immediately, turned into teens who lacked self-esteem and had difficulty relating to their peers. For those who waited for the second marshmallow, they turned out to be socially competent, self-assertive and academically successful. They averaged 210 points more in school exams compared to those who did not wait. For the past four decades, the "marshmallow test" has served as a classic experimental measure of children's self-control: will a preschooler eat one of the fluffy white confections now or hold out for two later? Now a new study demonstrates that being able to delay gratification is influenced as much by the environment as by innate ability. Children who experienced reliable interactions immediately before the marshmallow task waited on average four times longer—12 versus three minutes—than youngsters in similar but unreliable situations. "Our results definitely temper the popular perception that marshmallow-like tasks are very powerful diagnostics for self-control capacity," says Celeste Kidd, a doctoral candidate in brain and cognitive sciences at the University of Rochester and lead author on the study to be published online October 11 in the journal Cognition. 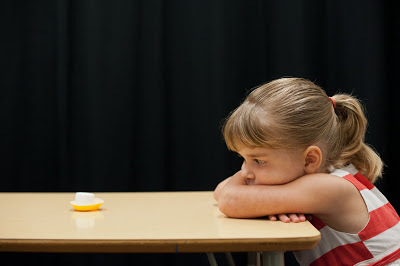 "Being able to delay gratification—in this case to wait 15 difficult minutes to earn a second marshmallow—not only reflects a child's capacity for self-control, it also reflects their belief about the practicality of waiting," says Kidd. "Delaying gratification is only the rational choice if the child believes a second marshmallow is likely to be delivered after a reasonably short delay." The findings provide an important reminder about the complexity of human behavior, adds coauthor Richard Aslin, the William R. Kenan Professor of brain and cognitive sciences at the University. "This study is an example of both nature and nurture playing a role," he says. "We know that to some extent, temperament is clearly inherited, because infants differ in their behaviors from birth. But this experiment provides robust evidence that young children's action are also based on rational decisions about their environment." The research builds on a long series of marshmallow-related studies that began at Stanford University in the late 1960s. Walter Mischel and other researchers famously showed that individual differences in the ability to delay gratification on this simple task correlated strongly with success in later life. Longer wait times as a child were linked years later to higher SAT scores, less substance abuse, and parental reports of better social skills. Because of the surprising correlation, the landmark marshmallow studies have been cited as evidence that qualities like self-control or emotional intelligence in general may be more important to navigating life successfully than more traditional measures of intelligence, such as IQ. The Rochester team wanted to explore more closely why some preschoolers are able to resist the marshmallow while others succumb to licking, nibbling, and eventually swallowing the sugary treat. The researchers assigned 28 three- to five-year-olds to two contrasting environments: unreliable and reliable. The study results were so strong that a larger sample group was not required to ensure statistical accuracy and other factors, like the influence of hunger, were accounted for by randomly assigning participants to the two groups, according to the researchers. In both groups the children were given a create-your-own-cup kit and asked to decorate the blank paper that would be inserted in the cup. In the unreliable condition, the children were provided a container of used crayons and told that if they could wait, the researcher would return shortly with a bigger and better set of new art supplies for their project. After two and a half minutes, the research returned with this explanation: "I'm sorry, but I made a mistake. We don't have any other art supplies after all. But why don't you use these instead?" She then helped to open the crayon container. Next a quarter-inch sticker was placed on the table and the child was told that if he or she could wait, the researcher would return with a large selection of better stickers to use. After the same wait, the researcher again returned empty handed. The reliable group experienced the same set up, but the researcher returned with the promised materials: first with a rotating tray full of art supplies and the next time with five to seven large, die-cut stickers. The marshmallow task followed, with the explanation that the child could have "one marshmallow right now. Or – if you can wait for me to get more marshmallows from the other room – you can have two marshmallows to eat instead." The researcher removed the art supplies and placed a single marshmallow in a small desert dish four inches from the table's edge directly in front of the child. From an adjoining room, the researchers and the parent observed through a computer video camera until the first taste or 15 minutes had lapsed, whichever came first. All children then received three additional marshmallows. "Watching their strategies for waiting was quite entertaining," says Holly Palmeri, coauthor and coordinator of the Rochester Baby Lab. Kids danced in their seats, sang, and took pretend naps. Several took a bite from the bottom of the marshmallow then placed it back in the desert cup so it looked untouched. A few then nibbled off the top, forgetting they could then longer hide the evidence since both ends were eaten, she said. "We had one little boy who grabbed the marshmallow immediately and we thought he was going to eat it," recalled Kidd. Instead he sat on it. "Instead of covering his eyes, he covered the marshmallow." Children who experienced unreliable interactions with an experimenter waited for a mean time of three minutes and two seconds on the subsequent marshmallow task, while youngsters who experienced reliable interactions held out for 12 minutes and two seconds. Only one of the 14 children in the unreliable group waited the full 15 minutes, compared to nine children in the reliable condition. "I was astounded that the effect was so large," says Aslin. "I thought that we might get a difference of maybe a minute or so… You don't see effects like this very often." 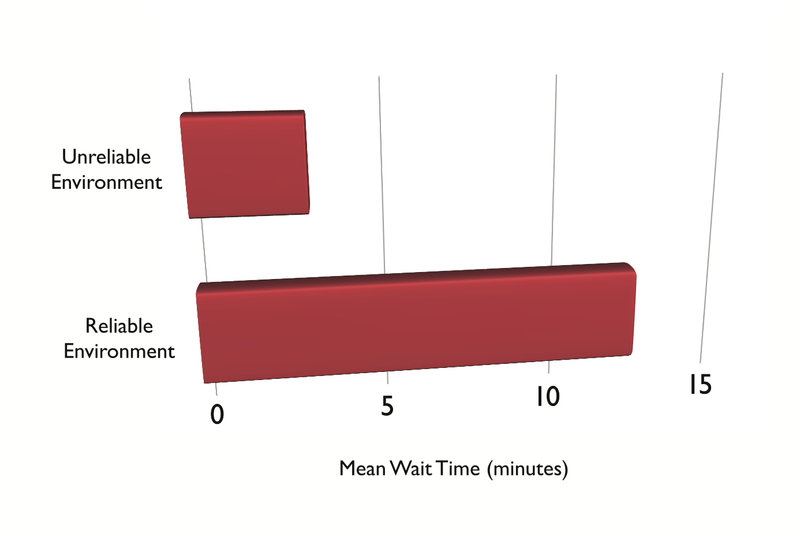 In prior research, children's wait time averaged between 6.08 and 5.71 minutes, the authors report. By comparison, manipulating the environment doubled wait times in the reliable condition and halved the time in the unreliable scenario. Previous studies that explored the effect of teaching children waiting strategies showed smaller effects, the authors report. Hiding the treat from view boosted wait times by 3.75 minutes, while encouraging children to think about the larger reward added 2.53 minutes. 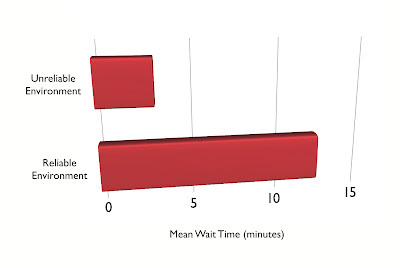 The robust effect of manipulating the environment, conclude the authors, provides strong evidence that children's wait times reflect rational decision making about the probability of reward. The results are consistent with other research showing that children are sensitive to uncertainty in future rewards and with population studies showing children with absent fathers prefer more immediate rewards over larger but delayed ones. The findings, says Kidd, are reassuring. She recalls reading about the predictive power of these earlier experiments years ago and finding it "depressing." At the time she was volunteering at a homeless shelter for families in Santa Ana, California. "There were lots of kids staying there with their families. Everyone shared one big area, so keeping personal possessions safe was difficult," she says. "When one child got a toy or treat, there was a real risk of a bigger, faster kid taking it away. I read about these studies and I thought, 'All of these kids would eat the marshmallow right away.' "
But as she observed the children week after week, she began to question the task as a marker of innate ability alone. "If you are used to getting things taken away from you, not waiting is the rational choice. Then it occurred to me that the marshmallow task might be correlated with something else that the child already knows—like having a stable environment." So does that mean that if little ones gobble up desert without waiting, as is typical of preschoolers, parents should worry that they have failed to be role models of reliability every minute? Not necessarily, say the researchers. "Children do monitor the behavior of parents and adults, but it is unlikely that they are keeping detailed records of every single action," says Aslin. "It's the overall sense of a parent's reliability or unreliability that's going to get through, not every single action." Adds Kidd: "Don't do the marshmallow test on your kitchen table and conclude something about your child. It especially would not work with a parent, because your child has all sorts of strong expectations about what a person who loves them very much is likely to do."